Mouthpieces are generally made of hard rubber, although some inexpensive mouthpieces may be made of plastic. Other materials such as crystal/glass, wood, ivory, and metal have also been used. Ligatures are often made out of metal and plated in nickel, silver or gold. Other ligature materials include wire, wire mesh, plastic, naugahyde, string, or leather. barrel this part of the instrument may be extended to fine-tune the clarinet. Upper joint: the holes and most keys of which are operated by the left hand. 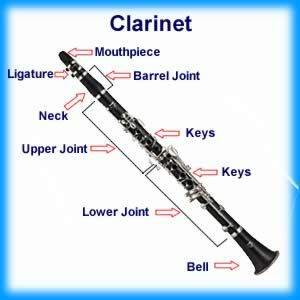 Lower joint : of clarinet is equipped with numerous tone holes of which seven (six front, one back) are covered with the fingertips, and the rest are opened or closed using a set of keys. Bell : Contrary to popular belief, the bell does not amplify the sound; rather, it improves the uniformity of the instrument's tone for the lowest notes in each register. the bell curves up and forward and is usually made of metal.